The Anthony J. Celebrezze Federal Building (also known as the Federal Office Building, the Celebrezze Building, or the Federal Building for short) is a skyscraper located in downtown Cleveland, Ohio. Designed by the firms of Outcault, Guenther, Rode & Bonebrake, Schafer, Flynn & Van Dijk, and Dalton, Dalton, Little, and Newport, the building has 32 stories, rises to a height of 419 feet (128 m), 1,007,000 square feet (93,600 m) of space,and is located at 1240 East 9th Street. Huber Hunt and Nicols served as general architects and contractors. It was completed in 1967 and houses U.S. government agency offices. 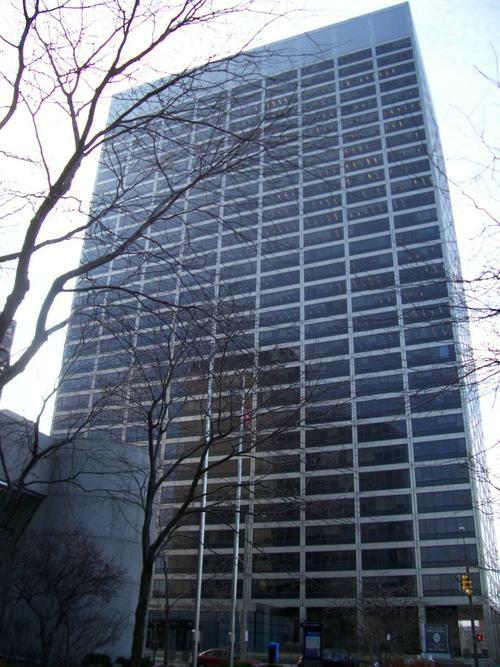 Named after Cleveland's 49th mayor, U.S. Secretary for Health, Education, and Welfare and Federal appeals judge Anthony J. Celebrezze, the Federal Building is typical of the modern, commercial office buildings of the 1960s. It displays strength in design through a purity and rich variety of materials. When construction began, protesters demonstrated against the lack of minority contractors. Problems with the foundation delayed construction. As the building was being built, a piece of the building's stainless-steel skin fell, hitting a parked car on Lakeside Avenue.